In the second game Lyell again raced to a lead, this time 7/1. 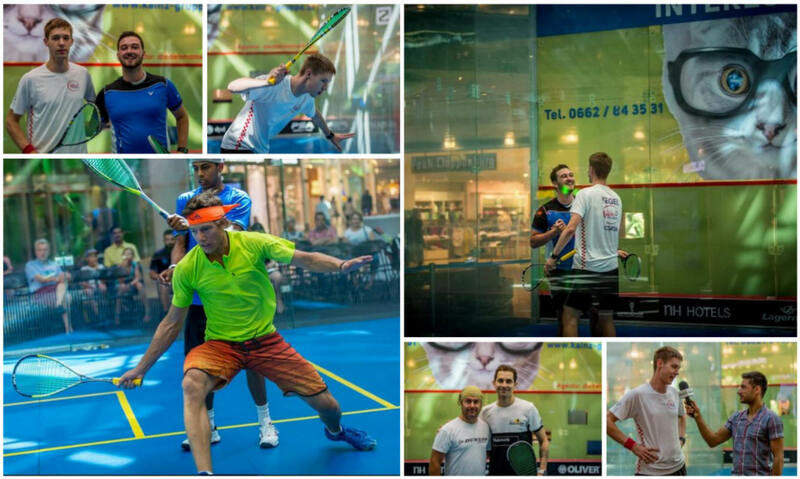 At this point Emyr had to take a medical time out after getting hit by the racket. He had to stop his lip from bleeding. After a 5 minute break Emyr couldn't fin his rhythm anymore and Lyell too the game comfortably 11/1. 08-Jun, Semis: Evans & Fuller to the top! The fourth was more or less decided after a few rallies. Emyr raced to an 8/0 lead. Brian again fought well but couldn't close the gap. 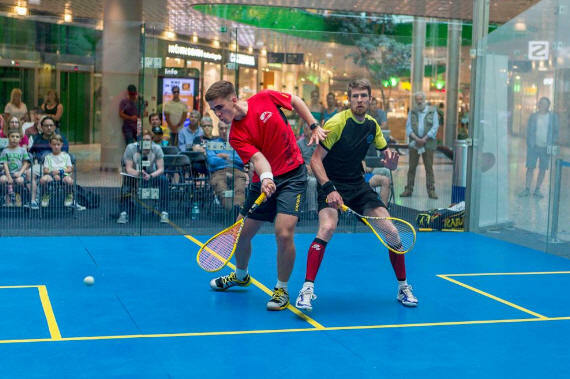 Welshman Emyr Evans booked his semifinal place at first when he beat Ahmed Hosny in tough four games. He will meet Brian Byrne from Ireland who stopped Spencer Lovejoy's run. The US-Boy came from qualifying and reached and upset himself yesterday when he beat topseed Jaymie Haycocks. This time Brian had the better and and won 3/1. The day of first round of the main draw of the Austrian Open started with a sad message - top seed Mohammed Alsarraj withdrew due to injury. This meant Lucky Loser Roshan Bharos (NED) got a second chance and just made it as he was just about to board the plane back home! The four qualifiers who made it into the main draw were decided today at the second round of qualification at the Austrian Open at EUROPARK shopping mall. 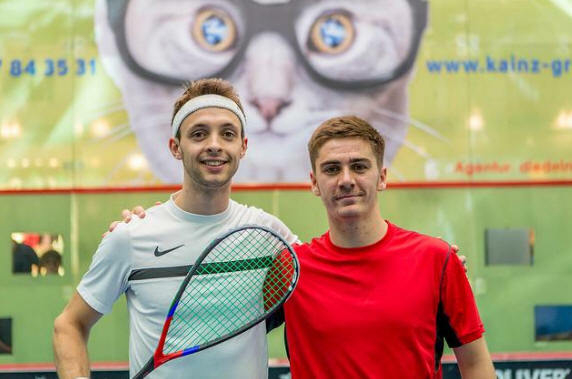 First on court was top seed Spencer Lovejoy (USA) and James Peach (ENG) The match was decided in three games to Spencer, however all games were very close with James even reaching two game balls in the third game. But The US-boy was able to save both of them and took the game 12/10. After 37min Spencer won 11/9, 11/8, 12/10. The next match on the glasscourt was between Jakub Solnicky (CZE) and Martin Kegel (CRO). Also this match ended up 3/0. It was the Czech Jakub who had the better end and won 11/9, 11/2, 11/8 after 35min. It was another 3/0 victory for Claudio Pinto from Portugal. He was too good today for his opponent Robert Dadds, who seemed to be not on his best today. Last on court was Vini Rodrigues from Brazil against Roshan Bharos from Holland. Vini had a bit more control in the first two games taking them 11/8 each. The last game was a more clear affair for the Brazilian winning 11/4. Tomorrow the big action will start with the main draw. Two Austrian’s – Jakob Dirnberger and defending Champion Aqeel Rehman will keep the local interests up. 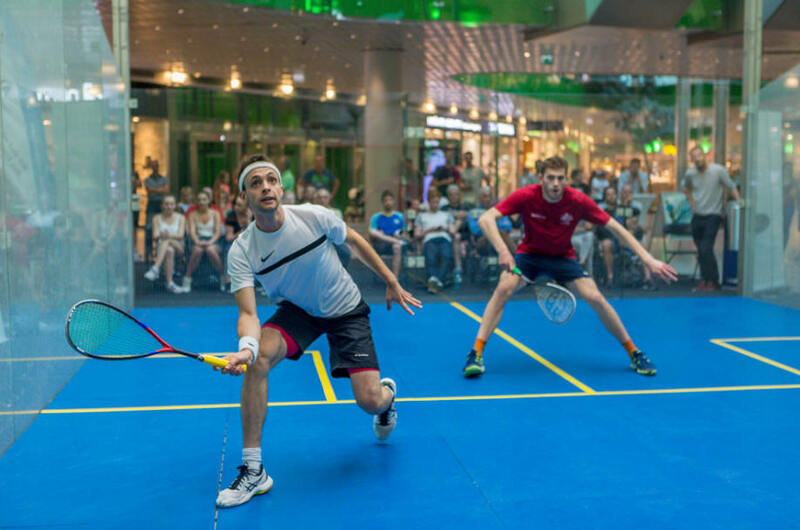 Jakob will meet fifth seed Lyell Fuller from England at 17:00, while Aqeel plays against Qualifier Claudio Pinto from Portugal at 18:00. National TV will report from tomorrow’s evening matches as well as National Radio. 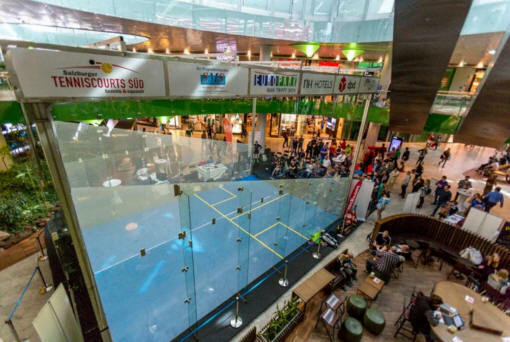 On Monday Austria's only PSA Tournament will take place for the 14th time in a row in Salzburg and for the 4th time on the All-Glasscourt in the EUROPARK shopping mall. 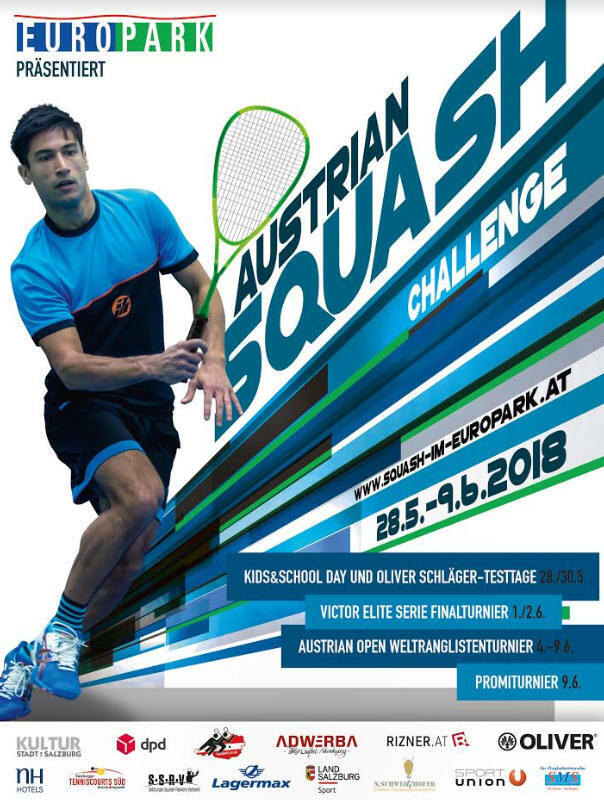 The Austrian Open is part of a two-week squash event called Austrian Squash Challenge. 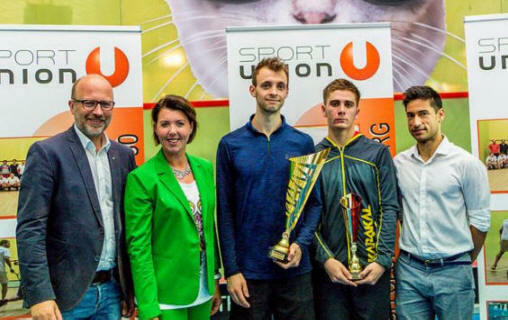 In the previous week the Austrian Elite Series Finals took place with Austria's best players competing against each other. Besides many promoting activities are happening such as the Kids&School Day where more than 300 Kids joined free clinics with Rehan van der Merwe and National Champion Aqeel Rehman. In the second week of the ASC it will be the international pro's to go on stage to compete at the Austrian Open. 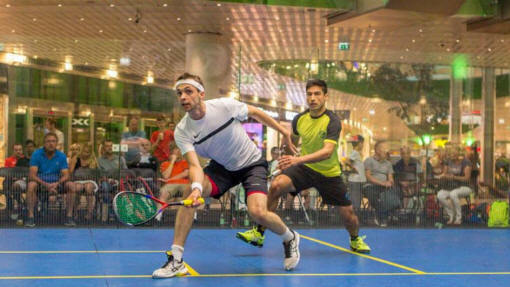 Defending Champion and local hero Aqeel Rehman is seeded fourth at the main draw, while Austria's number two Jakob Dirnberger received his main draw spot through a wildcard. Eight more Austrian players will try their best in the qualification to make it into the main draw. However their tasks are tough as they have to compete against the professionals from the PSA Tour. 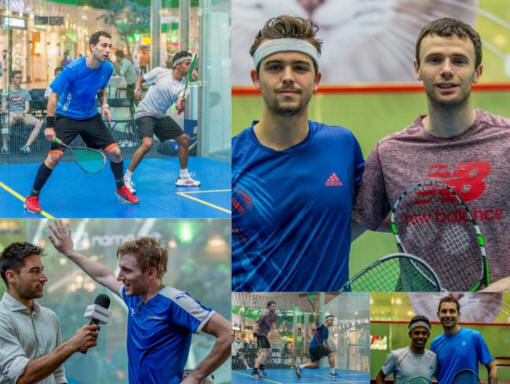 Anyway it will be a great experience for them and for sure a great advertisement for squash.